This post was originally featured on the Huffington Post. Picture the iconic sales rooms in movies like Wolf of Wall Street, Boiler Room, and Glengarry Glen Gary Ross: young professionals are pounding phones trying to make a sale. It was a simpler time by definition; the more you dialed, the more money you made...Then came the internet. With the sales and marketing process becoming ever more digital, sales managers struggle with finding the appropriate time to inject calling as a medium into their sales process. What’s more complicated is how difficult it is to become really sophisticated selling over the phone. In this article, we’ll walk through the typical costs involved in deploying call campaigns in-house, and learn how to avoid this costly exercise via simple math and sales hacking technology. Let’s start from the beginning. To make these calls in-house, a company will need multiple SDR/BDRs. The total cost of recruiting, hiring, onboarding, and training this talent can be very expensive, and these positions experience high attrition. Most SDR/BDRs will only last 1-2 years at a specific position. Keep in mind that this is after what we will assume is a 6 month onboarding and training period before they become productive (i.e. creating revenue for the company). In the following table, we have decided that a good BDR, with 2-5 years experience, would cost us around $65,000 in base compensation. After a number crunching session (detailed in the appendix), we find out that the cost of client acquisition per deal won becomes $10,833. This cost is absolutely fine for a high value product, however for lower valued products this becomes exceptionally expensive! Using phone as a medium can be very critical to a sales organization’s distribution plan. It is both top and bottom of the sales funnel type of activity, and if you hit the right person they are quickly monetized. The issue becomes quantifying the cost and that channel as a stable long-term channel. The costs associated with the recruiting, hiring, training, and mentoring aspects of a BDR/SDR make that monthly cost double, which poses a huge problem for sales teams. In searching for a solution, there are multiple options that could allow teams to bypass building their own expensive in-house team, including freelancers and call centers. However, both can prove to be more trouble than helpful in the short term. Freelancers need to be provided with basic training and contact lists. Although cost-effective, freelancers require an overwhelming effort in recruiting, have a high churn and are not always reliable. It’s also sometimes off-putting to share lists of leads to contacts outside the company. Call centers seem like a viable option at scale, but are not particularly fed by customer predictive data and don't optimize call performance automatically. Besides the well-known fact that call centers require high monthly call quotas and long-term contracts, usually 6 to 12 months. However, there’s a third option that solves for the shortcomings of the previous two options: an on-demand salesforce powered by an intelligent call platform. These applications plug directly into your CRM platform, optimizing ease and speed. With this model, a company can launch a live call campaign with the same ease as launching an email campaign from a browser. These campaigns are carried out by vetted live professional sales agents. The agents work within the sales call software, saving the company all costs associated with HR and infrastructure. VOIQ is this generation’s approach to outbound call campaigns, that allows you to keep call approaches in your strategy without building out a huge layer of BDRs in your organization. In this modern age of the internet, being able to leverage new technologies and stay current allows organizations to reach new levels of efficiency, productivity, and ultimately success. Learm more about VOIQ's approach to outbound calling and how it can benefit your organization! 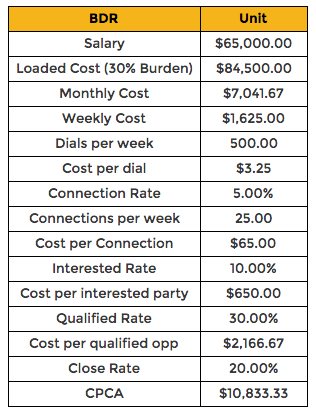 If we are focusing on phone as the primary medium of distribution for this BDR, we can assume the average rep makes 500 calls to prospects per week. This BDR is connecting, or actually talking to someone, 10% of the time, which means 50 pitches per week. Consider the average BDR salary to be $65,000. The average burden on salary is roughly 30%, so we are left with a total annual cost of $84,500. Weekly, this cost equates to $1,625.00 for the organization. Out of those 50 pitches, 10% (five prospects), will have the pain point that the product or service solves, and thus be interested. Assuming that 30% of these prospects are qualified (they are the decision maker, have budget, and are ready to buy) we are left with about 1.5 deals. Assuming a 20% close rate, we are left with about .3 deals closed won weekly.